Xherdan Shaqiri is evidently fully onboard with the long-term project Liverpool are striving to fulfil under the guidance of Jurgen Klopp. The Swiss international has embarked on a mission to lift silverware with the Reds after completing his £13million transfer from Stoke City. Anfield has long-appeared the likely destination for the forward following Stoke’s relegation to the Championship, with Shaqiri having also been linked with Liverpool four years ago. A move to Merseyside was blocked by Bayern Munich in 2014, despite Shaqiri making no secret of his desire to join the club. 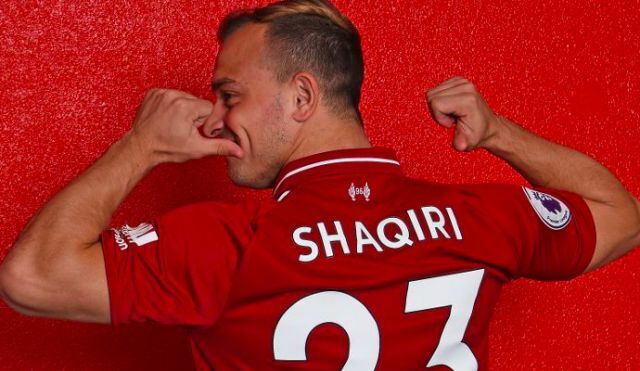 Now officially a Red, Shaqiri is eager to help the club achieve long-awaited Premier League title glory. Shaqiri arrives on the back of an impressive individual World Cup campaign, in which he played an instrumental role in leading the Swiss to the Round of 16. The 26-year-old finished as Stoke’s most productive player as they were relegated from the Premier League last season, registering eight goals and seven assists as his side’s one glimmer of hope. A gruelling campaign entailed familiar moments of individual ingenuity from a man with the traits capable of thriving among Liverpool’s elite attacking cohort. Besides serving as valuable cover in the wider positions, he also offers the tendency to drift centrally well-aligned to Klopp’s interchanging system. At £13million, he could prove a steal as a means of bolstering the squad’s strength in depth.